The final steps up towards the summit. After solid acclimatization period of almost three weeks we arrived at Everest Base Camp. The transport of equipment up to the higher camps, gave us an extended acclimatization and introduction with the terrain. Two more times up and down the Cumbu ice fall, till we reach altitude of 7200m by touching camp 3. After completing all segments: feeling good at altitude above 7000m, transporting all the equipment, getting familiar with the ice fall we go dow and rest while we wait for our turn for a summit push. At this time I had injured my leg, I was really concerned about my further performances. It was a crises I was facing at the BC, where all medical problems I've faced before, were now coming out the surface. That is one of the reasons why I took more time to rest and join the last group from our team to go up. Finally I over came all the problems and situations, and I completely recovered my leg. 17th of May was the moment when definitely we were confirmed that we are next to go up. It was Tim, me, Tom, Steve and Stuart left. Jon and Adam climbed on the 13th with pretty hard weather conditions. Day 6. South Cole 7995m - Summit 8848m - Camp 2, 6400m (Due to monsoon forecast we had to go down the same day). It was a very long walk of over 20h and 3500m altitude difference in a day. On camp 3, first time we try the use of oxygen masks. We used just a bit to try on the masks and hope for better sleep, and the next day we start using O2 on the way to South Cole. Unfortunately Tom left us before reaching the camp 3. He gave him self another try the next day, still he felt to tired to continue. He was pretty strong all the way, but it was not easy for him to carry all that heavy filming gear with. We spent long time together with our Sherpa guys in their common tent, looking as a patchwork, broken and patched on many places because of the strong wind. It is important to drink a lot at this time, so this was pretty much what we did all day, melting snow, making tea, drinking, snacks, preparing the gear, and preparing mentally for the big day. The 22nd of May, at around 8:30 pm. we were ready for summit push. Here, another member of our team decided to stop with his climb and turn around. Stuard, a super strong and experienced guy with dozens of marathons and mountain peaks behind. I am sure he will complete his challenge next time. We are starting from south Cole up the steep hill towards the Balcony. At this point both Sherpa and foreign climbers use bottles of O2. I had not good luck with my torch which was not working properly from the beginning even though I just changed the battery pack.I was almost walking in the dark, which was good for the moment we had to pass over a dead body, just below the Balcony. In the dark I could hardly notice the Bangladeshi guy who passed away few days before. They say it is good to divide your strategic goals in a smaller visual goals. 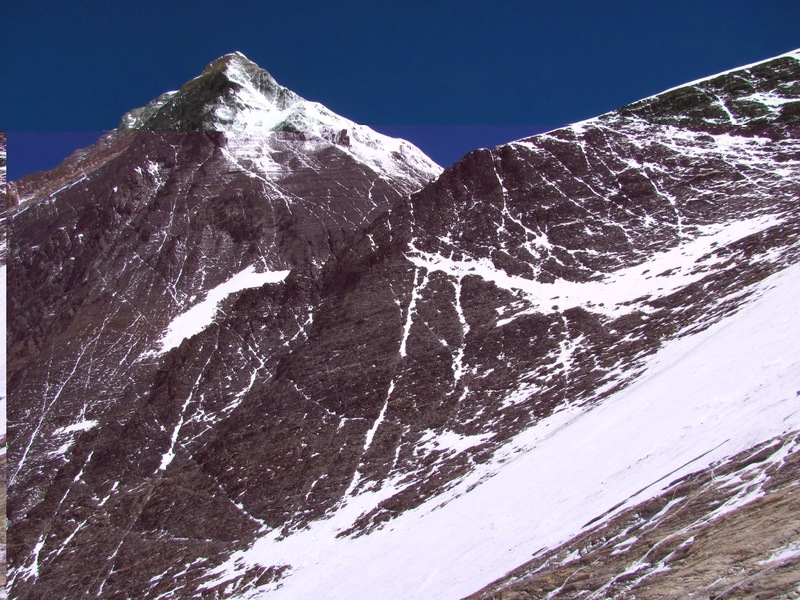 Once you climb up to the Balcony, you set the South summit as a next goal, once you reach it, you set the Hillary step as a next goal, and from Hillary step, not many people turn around. From Hilary step to the summit it took us probably less than 1 hour. On the Balcony we changed an O2 bottle, we left the half empty one there to have it on the way back. There are many steep sections all the way to the summit where we are fixed to the fix rope. For me, I always find it helpful to use the Ice axe as well, even though many people relay just on the fixed rope. There was none else on the route. That is one of the reasons why we started so early in the night. Normally 10 h is the average time from South Cole to the summit, so we were expecting to be there right on sunrise. We were walking pretty fast I guess, but the no-crowd fact also contributed for our fast ascent. Reaching the south summit was another steep section. This was the only day when we were accompanied by a sherpa 1x1. I felt secure in the team even though my sherpa was not an experienced one. He felt sick in the stomach all the way so I felt he was in a rush :) The other sherpa from the team, were really experienced and they kept a good aura all the way. If I was not with them I guess I would have been much slower and have had more breaks on the way. Still, I am very happy it turned out that way, so we all followed a bit faster pase, so we had no one to wait for on the crucial sections like the Hillary step. For me it was like in a dream because my torch was completely off, so Hillary step I had to climb in the dark, of course helped by the light from my sherpa. My long climbing experience gave me good preparation for this section where I didn't have to struggle. The full moon was also on our side, giving us some extra light all around. After the South summit and the Hillary step, we had to follow a traverse on the ridge with steep edges down both sides. I saw the altitude on my watch, even though this is not a reliable device it gives me some kind of orientation where we are. I knew than that we have reached almost the height of the summit and this last ridge will take us there. We had good timing, almost perfect weather conditions and we all felt good our selves, so I knew that the summit is here for all of us. These are the moments where I felt the tears and happiness even before I saw the summit flags. The summit it self came sooner that I expected. There, on 8848m I arrived few minutes after Tim Mosedale, the leader of our expedition and his sherpa Ang Kaji. Tim is a brilliant leader with huge experience both with people and with mountains. 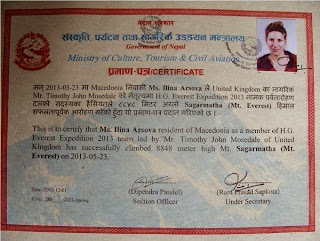 I highly recommend this trip with him as well as the Ama Dablam expedition as a preparation before Everest. We congratulated each other and he went down. We were on the summit at 3:15 in th emorning which is the coldest part of the day. temperatures were probably -30, so nobody could stay long. At one point I was alone with my sherpa, Pasang Gelge. Just short after me, the Swedish Torbjorn Halstrom with his sherpa arrived, who were part of a different group. It was a great moment to see him on the top, since we met and had a nice talk somewhere on the way. He climbed as the oldest Swedish on the age of 53. At about same time on the summit was the 57 year old, English- Australian Steve Wyatt - oldest Australian on the top of the world. Steve was part of our team and he was accompanied by another two sherpa: Lackpa and Chabu. We were chasing each other on the way up and down all the way throughout the climb. On the summit I don't really know what I felt, it was like a dream that just came true. I became the first Macedonian woman to scale 8848m, which made me happy not only for my self but for my country as well. I believed that this accomplishment will be a good motif for other sportsmen, inspiration for the people who support me, also a good promotion for Macedonia and for the mountain sports in Macedonia. I am so gratefuller to everyone who supported me and believed in this idea. After the highest one, there are many more mountains to climb. The challenge never stops! You can be part of it! 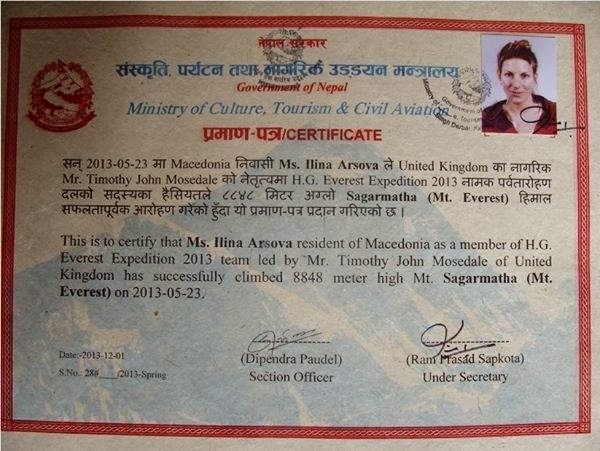 Contact me for any info about trekking, expeditions, private guiding. Balcony 8400m, two yellow tents behind are here with a reason. 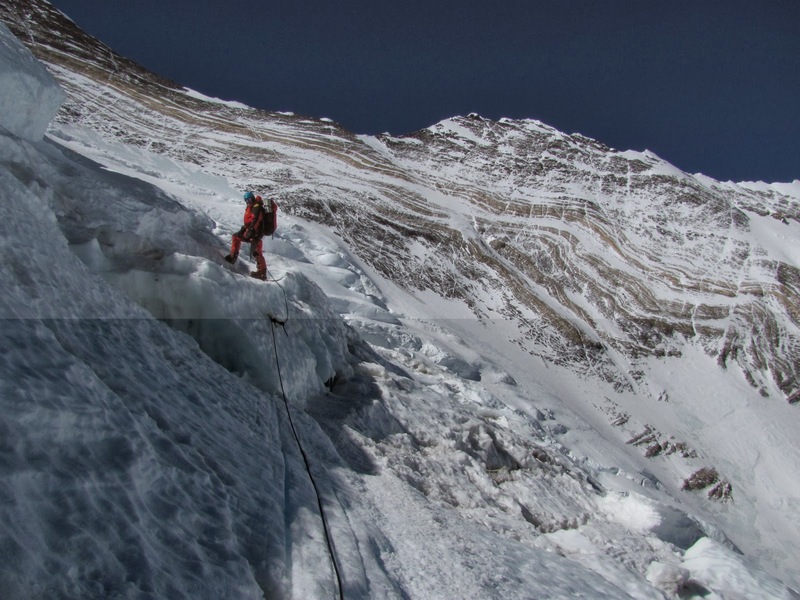 Climbers are acclimatizing for no O2 ascent attempt.